Anti-gay hate group leader Tony Perkins has appeared on Megyn Kelly's shows more than all other Fox News programs combined over the past two years. Tony Perkins is the president of the Family Research Council (FRC), an organization that was labeled an anti-gay "hate group" by the Southern Poverty Law Center in 2010. He has called pedophilia "a homosexual problem," claimed that gay men "recruit" children into homosexuality, and endorsed a Uganda law that would have imposed the death penalty for homosexuality. His organization regularly produces anti-gay propaganda depicting gay people as abnormal, unnatural, and destined for "eternal damnation." But these numbers don't fully account for Kelly's role in whitewashing the anti-LGBT animus that motivates Perkins' and FRC's work. She's described FRC as "a group whose mission is to advance faith, family, and freedom in public policy and culture from a Christian worldview." And Kelly has repeatedly peddled Perkins' own talking points - suggesting that "Christian beliefs and Christian rights" are being trampled as LGBT rights are ascendant, charging gay rights activists with being intolerant, and lamenting that it must be "alienating" for Perkins to be criticized for his anti-LGBT views. 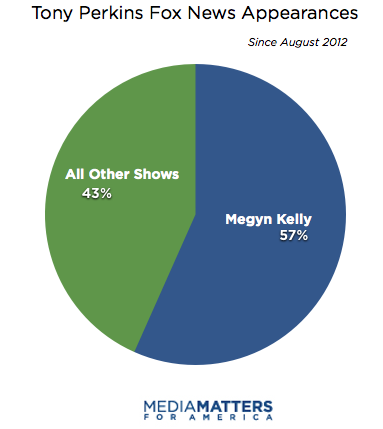 Kelly's cozy relationship with Perkins undermines her carefully crafted image as a straight shooter at Fox News. By mainstreaming Perkins and allowing him to peddle bigoted talking points with impunity, Kelly has instead proven herself to be one of the most valuable media allies an anti-gay hate group could ask for. Equality Matters searched TV Eyes, LexisNexis, and the Family Research Council's video archives for Fox News transcripts between August 28, 2012 (the conclusion of the 2012 GOP presidential primary season) and August 6, 2014 using the terms "Tony Perkins," "Tony Perkins AND Family Research Council," "Perkins AND Family Research Council," and "Tony AND Family Research Council."